Daughter-in-law of Judah. After the death of her husband, Er, she married his brother Onan; but when he also died, Judah sent her back to her father's house, fearing to let her marry his third son, Shelah. When Tamar saw that Shelah, having reached maturity, did not marry her, she disguised herself and met Judah on his way to Timnath. Supposing her to be of questionable virtue, he approached her and entered into relations with her that resulted in her pregnancy. As a pledge of payment, he left with her his staff, seal, and belt. When her condition was discovered, and she was about to be burned to death in punishment for unchastity, she confronted her father-in-law with the tokens he had left with her, declaring that she was with child by the man to whom they belonged. She bore him the twins Zarah and Pharez (Gen. xxxviii.). 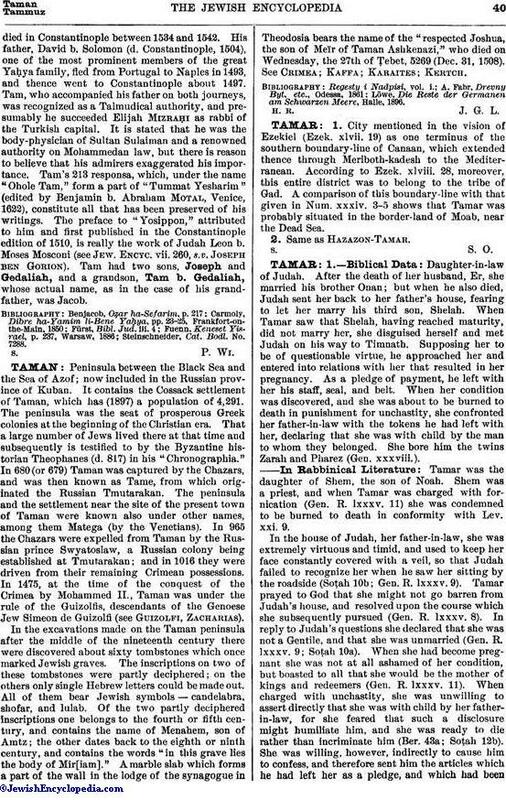 Tamar was the daughter of Shem, the son of Noah. Shem was a priest, and when Tamar was charged with fornication (Gen. R. lxxxv. 11) she was condemned to be burned to death in conformity with Lev. xxi. 9. In the house of Judah, her father-in-law, she was extremely virtuous and timid, and used to keep her face constantly covered with a veil, so that Judah failed to recognize her when he saw her sitting by the roadside (Soṭah 10b; Gen. R. lxxxv. 9). Tamar prayed to God that she might not go barren from Judah's house, and resolved upon the course which she subsequently pursued (Gen. R. lxxxv. 8). In reply to Judah's questions she declared that she was not a Gentile, and that she was unmarried (Gen. R. lxxxv. 9; Soṭah 10a). When she had become pregnant she was not at all ashamed of her condition, but boasted to all that she would be the mother of kings and redeemers (Gen. R. lxxxv. 11). When charged with unchastity, she was unwilling to assert directly that she was with child by her father-in-law, for she feared that such a disclosure might humiliate him, and she was ready to die rather than incriminate him (Ber. 43a; Soṭah 12b). She was willing, however, indirectly to cause him to confess, and therefore sent him the articles which he had left her as a pledge, and which had beentaken from her by Samael and restored by Gabriel. After her innocence had been proved, Judah continued to live with her in marital relations (Soṭah 10b). Sister of Absalom, and the victim of the passion of her half-brother Amnon. At the suggestion of Jonadab, his confidant, Amnon feigned illness, and Tamar was sent by the king to his apartment to prepare food for him. Amnon took advantage of this opportunity to dishonor her forcibly, after which he drove her away. Weeping and lamenting, she went to her brother Absalom, in whose house she remained. Absalom avenged his sister two years later by killing Amnon (II Sam. xiii.). Tamar was the natural daughter of David by a captive whom he married after she had abjured her Gentile religion, and who became the mother of Absalom. Because of her illegitimacy it would have been lawful for her to marry Amnon, the son of David, and she therefore besought him (II Sam. xiii. 13) not to dishonor her, but to ask the king to bestow her on him as his wife, a request which would surely have been granted (Sanh. 21a).